For a number of years I have been collecting children’s picturebooks from other countries when I travel or friends and relatives do. It is good to be aware of the visual voices from other lands, so now and then I will post images of a few. The first entry in this series was October, 2010, so check it out in the archives, if you are interested. My sister-in-law Baiba and her husband Ron have just returned from three fantastic weeks in Turkey where they bought a copy of Köpek Baliǧi Keskín by Hílal Üsküdar Gürbüz in cooperation with Psikolojik Danişman, which they have kindly given to me. I do not speak the language, nor do I know anyone who does, so my apologies if any of my extrapolations about the story are incorrect. This bright and energetically illustrated story is about a shark wearing a yellow fedora who is lonely because the fishes, octopus and seastars nearby do not want to play with him. Perhaps it is that mouthful of sharp, pointy teeth evident when he smiles? In one image, there are tears dripping from his sad eyes which is humorous since he is meanwhile submersed in salt water. The pointy-toothed main character goes to a sage old shark for advice and is told a story that seems to be about a sinking fishing boat and an enormous whale. In that story seems to be a solution, resulting in a satisfying scene at the end of the book with everyone playing together. The artwork is comprised of vibrant watercolor washes, dramatic scale changes, and good use of asymmetric areas open to the white of the page. 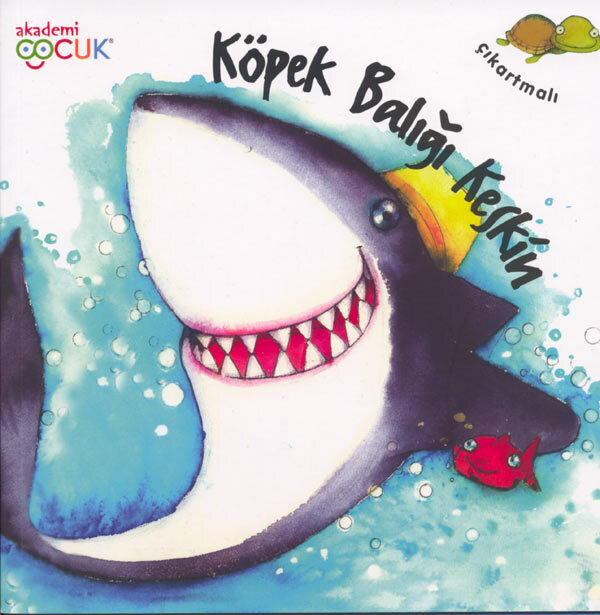 Köpek Baliǧi Keskín is part of a series of books available through www.akademicocuk.com geared for ages 0-6. Baiba and Ron also brought me a few Turkish coins that are destined to be used in Jenny’s Pocket Change, a non-fiction picturebook about American and world coins which I am working on in between other projects. I am grateful for their cultural input! The world is a marvelous place where common ground between creative people everywhere can build connections. This entry was posted in children's books, reviews, World of Books and tagged book art, children's books, world books. Bookmark the permalink. Post a comment or leave a trackback: Trackback URL.